Recently I had the pleasure to hang out with fellow gluten free food bloggers and what a time we had. We spent a lot of the time eating of course and then taking pictures of the food. We were in an amazing setting in the woods that was so peaceful except for our giggling fits. 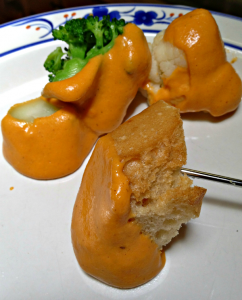 One of the meals we shared was a Dairy Free Cheese Fondue. We dipped gluten free bagette, broccoli and cauliflower florets into the creamy fondue. We also had a side of Sweet Italian Sausage that we could dip into the cheese on our plate so we could keep the fondue pot vegetarian for our vegetarian guests. This is not the first time I’ve made this fondue recipe. My youngest son requested it for his birthday and after I made it the first time I was totally hooked. I know if you give this a try you will be too. This recipe is not mine but one from The Ultimate Uncheese Cookbook: Delicious Dairy-Free Cheeses and Classic “Uncheese” Dishes . 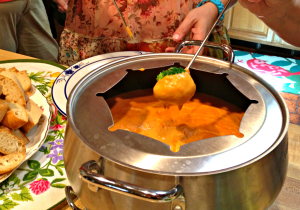 I choose the Chedda Fondue from the selection of fondue recipes. Yes there are quite a few in there like Pizza, Swiss, Smoky, Classic, Pub, and South-of-the-Border Fondue. Not only are there fondue recipes but all of your favorite cheese recipes that are all non-dairy. Each recipe is noted if it is vegan, gluten free, soy free, and more. If you are living dairy free and miss that cheesy gooeyness, check out this book. We made a single batch and I don’t think we had any leftovers. When I made it for my son and two friends we did have some leftovers because he also had a broth fondue and a chocolate fondue to fill them up. I took the chedda leftovers and mixed it into cooked pasta to make Mac & Cheese. Yum! If you’re like me and there are certain cookbooks you really like to travel with but you don’t want to carry all your cookbooks, put them on your Kindle or iPad. You can get The Ultimate Uncheese Cookbook for your Kindle and be reading it right now. For a more visual representation of this amazing fondue check out this short video. Place all the ingredient in a blender and process several minutes until the mixture is completely smooth. Pour into a medium saucepan and bring to a boil, stirring constantly. Reduce heat to low, and continue to stir and cook a few minutes longer until thick and smooth. Transfer to a fondue pot and keep warm over a very low flame. From The Ultimate Uncheese Cookbook, copyright Jo Stepaniak, reprinted by permission of the author. Now I want to hear from you! Let me know if you’ve tried this and what you think. Also, what would you do with the leftovers, if you have any? Yum! What I am most interested in is how you came to hang out with so many fellow food bloggers Diane…what fun!! I can't wait for an opportunity like that! I'm so happy I got to try this fondue with you, Diane! I ordered the cookbook before leaving the table and it nearly beat me home. Fondue is back amongst the foods I can eat now and this one is every bit as delicious as any dairy cheese fondue I've had. Thanks for introducing me to this. What an amazing meal! The fondue, the company, the laughter…just amazing. And the video is fabulous, Diane! Great job!!! oh that sounds so delicious! i have been craving fondue lately — this is perfect! Yum, yum, yum Diane! Such an amazing gathering I'm sure – wish I could have been there! That was a great fondue! I just got my cookbook this afternoon. Thanks for bringing it with you so we could all check it out. 🙂 I had fun cooking with you! Diane, I am wondering if you could recommend an alternative to the cashews for this recipe. Both of my kiddos and myself are dairy free and miss out on a lot of "cheese-like" recipes because I also am allergic to cashews (and walnuts). Is there any substitute you can give? I'd love to try this and my son would be over the moon if I could let him have this as a nachos and cheese snack. Thanks!